Category: The Savoy Tea Co.
Sunday! It’s here. Sunday is a day that we both love and dread. Mainly because work and school take over tomorrow. I’m trying hard to wake up this morning with a hearty English Breakfast from Harney and Sons. It was a whirlwind Saturday and Sunday is starting loudly with Spiderman and Black Panther and all of their sound effects are pinging off the walls. Of course after days without the grands we had to grab them up on Saturday. First though we went to the Farmer’s Market. We go to the OSU-OKC one because everything must be made or raised in Oklahoma and is organic. OU Boy found a cantaloupe that smelled just right and he guarded that thing like a newborn. There was a really good bluegrass band playing and we got a ton of good veggies and fruit. Plus some new tea blends from my tea lady from Norman. Then on the way home we stopped at Will Rogers Park and Tennis Center and walked the gardens. 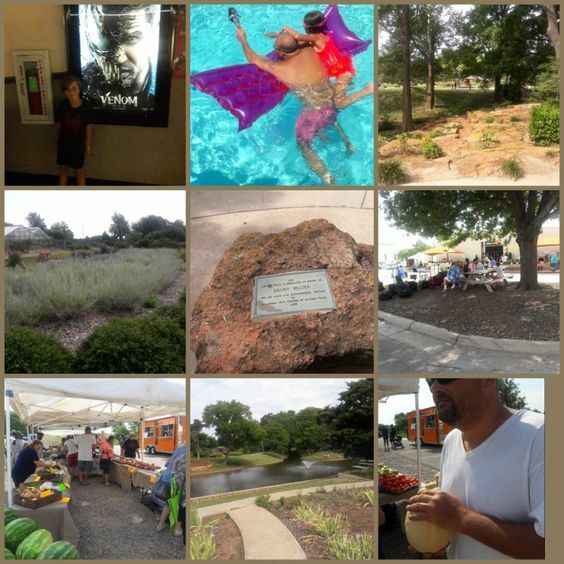 This is such a beautiful nature park, with an aquatics center, plenty of hiking trails and flower and herb gardens plus a professional tennis set up. Then it was home to the pool. We knew we wanted to go see Jurassic World and I thought it started at 4:30 so we headed to the mall only to find it was tax-free weekend and everyone on the planet was at the mall. We decided to go get our tickets first and found out the movie was starting in 10 minutes. So in we went. We left Charli Ava and Papa to get the popcorn while Corbin decided where to sit. Back row. The movie was basically the same premise as always. Dinosaurs go rogue and kill people. The kids wanted to spend some money so they took hours to pick something out and by that time I did what most parents do when they are ready for a strong drink. Went through McDonald’s. Then we popped in Mrs. Doubtfire and the kids thought that was hilarious. They fell asleep before the credits rolled and we all went straight to bed. Today OU Boy is working and I am taking a minute to sip and write. After breakfast we are headed to the pool. Both of the kids love their new teachers and each of them have friends from last year in their new class. Personally I am going to need a nap today. What fun did y’all have this weekend? WE made it to Friday and the heavens have rewarded us with rain. Glorious, much-needed rain. The kids are still snuggled in their beds watching Goosebumps on their pads so it’s quiet except for the rain falling. Yesterday at tea time, we made a pot of the Sugar Plum Fairy Tea. The smell was wonderful with the almonds coming through nicely. It is a light green tea and very smooth with notes of pink peppercorn coming through followed by the wonderful aroma and taste of almond. Charli tried hers with a Clover Blossom Honey Spoon. 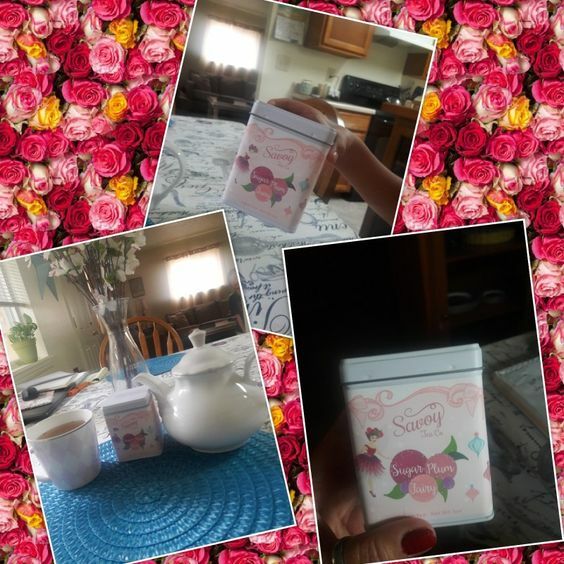 We did not think that adding sweetness to the tea added anything to it so we drank ours without sweetener and she licked the honey spoon like a lollipop. I have to say it was really good and I plan to go back this weekend and get the Blue and Pink ones. We got in a game of tennis yesterday before it started to sprinkle, so we went to Wal-Mart. I have to take a xanax just to go in there, but they are the only ones that carry the brand of body gel I like. It gives you a nice glow but it is also waterproof and keeps my skin from coming into contact with chlorine in the pool. We’re a sensitive lot. While there we saw what I am assuming were teachers buying out every supply in the store. I asked them what were they doing. Apparently some schools are just telling parents to send in $20 and they will provide the supplies. I was outraged! Buying school supplies is a personal thing. If my kid wants all purple supplies, she’s getting all purple supplies. If it makes her excited to pick out her own stuff, then she’s doing that. We look forward to new supplies day, even after all these years of teaching I still love it. So no, good sir, we will not go with the flow. We are making our own choices. This isn’t a facist state just yet! Have a good one! WE are snuggling up with Mrs. Doubtfire because they have never seen it! Lord I feel old!